Claudia Hellebush, (right) the President of the United Way of Chester County and Brian Parsons, the Senior Vice President, Products, of West Chester-based Communications Test Design discuss the benefits of businesses giving back to the community, Wednesday. COATESVILLE — Is it possible to get something back when you give? 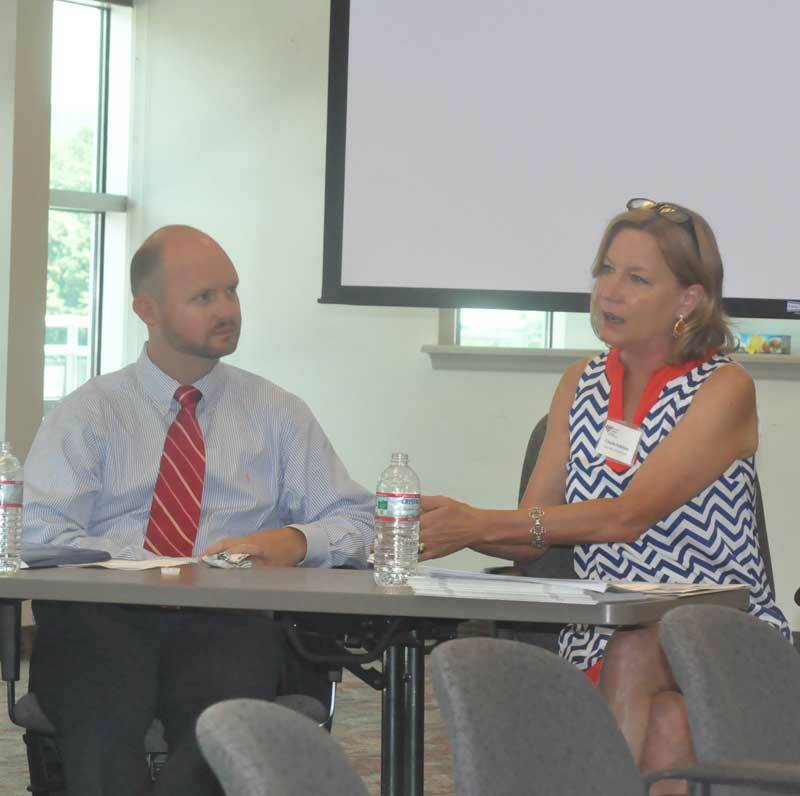 Parsons joined Claudia Hellebush, the President of the United Way of Chester County for a lunch discussion of the merits of Social Capital to local business, an event sponsored by the Western Chester County Chamber of Commerce at the Brandywine Center, Wednesday. And while raising money for charities such as the United Way is a worthy endeavor, Parsons said, there is real value for his company and his employees — bringing people together, building stronger social bonds among team members and improving morale in the company. Parsons — a third generation leader at the family-owned company — described various videos and skits put on each year to kickoff the annual giving campaign — noting his father Gerald J. Parsons, the company’s chairman and CEO, often takes the most potentially embarrassing roles, in part to build esprit d’ corps. CTDI employs 1,400 people in Chester County — of nearly 6,000 worldwide — servicing and repairing telecommunications devices. While most folks may not know them, if they have cable television or a mobile phone, they have been directly impacted by them, as they handle repair and fulfillment for Verizon and Comcast, among many others, and they supply parts and repairs to major wireless carriers. And while the stresses of working for a company that started in a garage on Boot Road in West Chester in 1975 and has now grown to encompass 56 facilities in the Americas, Europe and Asia might seem daunting enough, asking employees to work together to give back to their local communities builds a deep sense of teamwork, Parsons said, making CTDI a more enjoyable place to work, aiding employee retention, he said. In addition to working on behalf of the United Way, CTDI raises money annually for the YMCA, the Shine Cancer Foundation, the Archdiocese of Philadelphia and hosts a number of community events including the annual West Chester Children’s Christmas party for needy children. Hellebush said she routinely sees how companies benefit from being involved in giving back to the community — and how it directly impacts employee morale and retention. She noted that companies or employees don’t need to worry that they need to raise large amounts of money to participate — even small donations matter. “A dollar a week might not seem like much, but to a mother who needs diapers for her child, it is a lot,” she said. Offering a bit of an update on the current status of the United Way of Chester County, Hellebush said that it is current funding between 50 and 60 agencies, which in turn then provide services to those in need in the community. 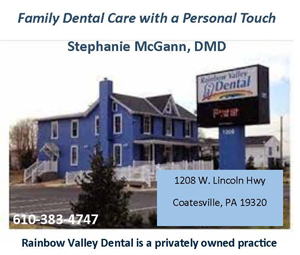 One of those agencies — and a co-host of the event — is Chester County Community Dental, which provides dental care to those in need in the greater Coatesville area. According to Regina Horton Lewis, Executive Director of CCCD, some 4,000 patients were treated in 2012 — with those numbers likely to increase in 2013. In addition to treating emergent care needs, CCCD is getting more patients in regularly for checkups and maintenance care, improving overall health and catching issues before they become major problems.